Adapted from Joyce's literary masterpiece set in 1904, the last and best known of the short stories collected in The Dubliners, this intimate musical portrays a homespun Yuletide party with Irish music, dancing, food, drink and good fellowship. Sparkling songs, many of them traditional sounding Irish melodies that are performed as entertainment by the partygoers, are all original. Christopher Walken starred in a production that moved from Playwrights Horizon to Broadway. Winner! 2000 Tony® Award for Best Musical Book. Setting: The Misses Morkans' annual Christmas-time party. Dublin. Near the turn of the century. 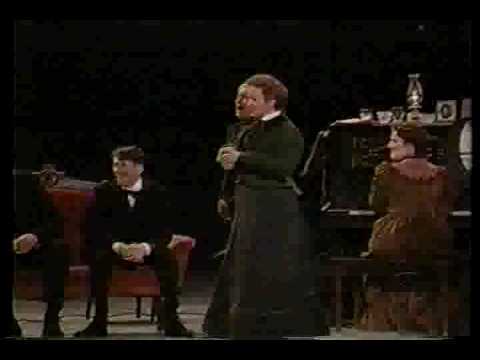 Jame's Joyce's THE DEAD first premiered Off Broadway at Playwright's Horizons in 1999. It then transferred to Broadway at the Belasco Theatre in 2000.